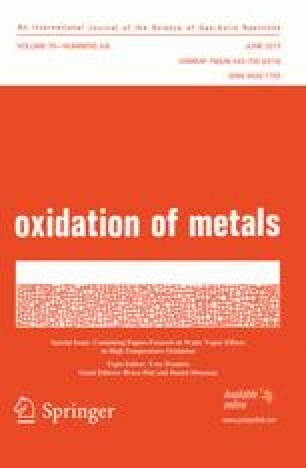 The effect of water vapor on the oxidation behavior of a Ni–25wt.%Cr alloy in air was studied between 1000 and 1300 °C by comparing, after test in dry air and in a humidified air, mass gain results and surface/sub-surface metallographic observations. It was found that, for the conditions studied, the transient oxidation at the beginning of the isothermal stage and the isothermal oxidation are both slightly slower in wet air than in dry air. The oxide formed in wet air over the surface tended to be less coarse and less thick than the one formed in dry air. The chromium depletion depths in the sub-surface were similar between the two atmospheres but the concentration at the oxide/alloy interface was higher for wet air than for dry air oxidation. The oxide scale formed in wet air seemed more resistant against spallation at cooling than the scale formed in dry air. The authors wish to gratefully thank the Common Service of Electronic Microprobe and Microanalyses, especially Sandrine Mathieu (FEG-SEM examinations) and Olivier Rouer (WDS Microprobe measurements), as well as Pascal Villeger (XRD runs).